With Pumpkin Cross presented by Local Ride Bike Shop looming, it’s time to put the final touches on your costumes, register, and get pumped up for a day of spooky fun on your bike. Local Ride Bike Shop can help with all of the above just in time for Sunday’s big event. Pumpkin Cross will also be experiencing some star power on Sunday with current World XC Mountain Bike Champion and Olympian Catharine Pendrel of Kamloops set to contest the elite women’s competition. 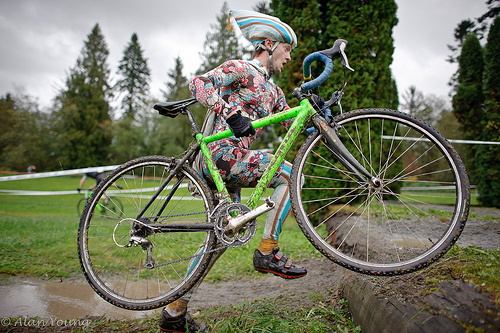 Pumpkin Cross has a history of celebrity sightings, including Austin Powers, the Count, the Incredible Hulk, Britney Spears, the Ninja Turtles, Peewee Herman, and singlespeed Cyclo-Cross World Champ Drew Mckenzie. If you miss the pre-registration deadline, you can download the Pumpkin Cross registration form (PDF) here, print and fill it out at home, and present your $35 cash (plus $10 day-of license, if applicable) to the lovely (or ghoulish) volunteers at registration on Sunday. Exact change is greatly appreciated.